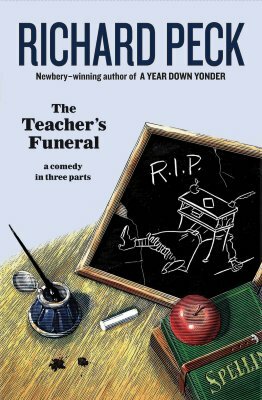 If your teacher has to die, August isn't a bad time of year for it," begins Richard Peck's latest novel, a book full of his signature wit and sass. Russell Culver is fifteen in 1904, and he's raring to leave his tiny Indiana farm town for the endless sky of the Dakotas. To him, school has been nothing but a chain holding him back from his dreams. Maybe now that his teacher has passed on, they'll shut the school down entirely and leave him free to roam. No such luck. Russell has a particularly eventful season of schooling ahead of him, led by a teacher he never could have predicted-perhaps the only teacher equipped to control the likes of him: his sister Tansy. Despite stolen supplies, a privy fire, and more than any classroom's share of snakes, Tansy will manage to keep that school alive and maybe, just maybe, set her brother on a new, wiser course.